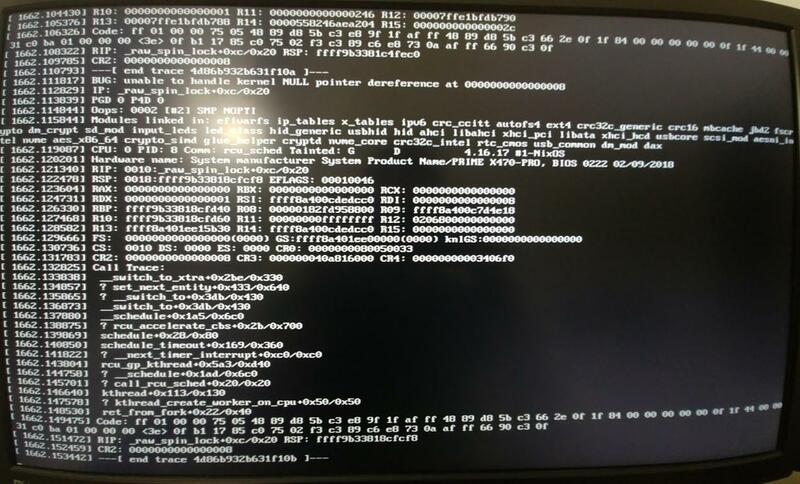 I have been getting spontaneous crashes on my newly built NixOS machine. I am trying out different configuration options to see if I can avoid them. Jun 24 16:08:12 mus pulseaudio: Failed to load module "module-native-protocol-unix" (argument: ""): initialization failed. Jun 24 16:08:12 mus pulseaudio: Module load failed. Jun 24 16:08:12 mus pulseaudio: Failed to initialize daemon. The first ACPI errors are suspicious, so I tried rebooting with acpi=off in my boot.kernelParams. Unfortunately, this configuration results in a kernel null-deref error on bootup. I found no ACPI options in my BIOS (mobo is ASUS Prime X470-Pro AMD Ryzen 2 AM4 DDR4 DP HDMI M.2 USB 3.1 ATX). So perhaps there are some compatibility issues that I am missing. What is the reason that I am unable to activate acpi=off? I am on Linux kernel 4.16.17, and NixOS 18.03. Browse other questions tagged boot kernel-modules acpi nixos or ask your own question. How do I debug a kernel module in which a NULL pointer appears?